Like it or not Christmas is less than 100 days away. Yikes! It is time to start getting our craft on to make all those adorable pins on Pinterest we all have for Christmas presents!! I made these last year for my girls and they lived them so much I am making some for my niece this year. 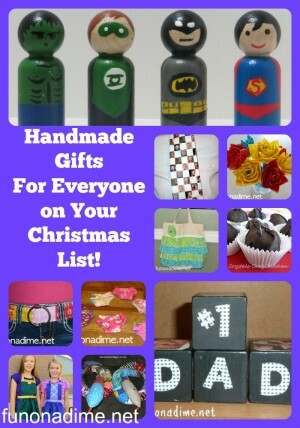 I am sure the little girl in your life will love them too! 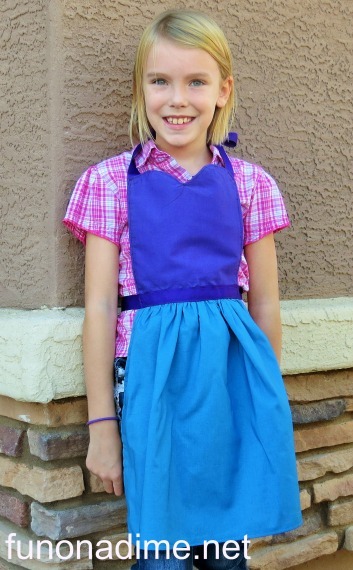 I saw a picture of very cute Princess aprons when I was on Pinterest (of course) and I thought dress up aprons was a fabulous idea. They would be able to be worn by kids of all ages and would be so much more sturdy than flimsy costumes. I just couldn’t bring myself to buy them they were sooooo expensive. I decided I would try and figure out how to make them. I was successful and now I will pass it on to all of you!! This post contains affiliate links – thanks for supporting my blog! I Am Sharing The Pattern With You! They turned out to be very inexpensive and easy to make. The first one took me about an hour because I was playing around with the pattern and the rest only about 20 minutes. You can really make as many different kinds as your imagination allows. I am making a Cinderella, Snow White, Merida, Sleeping Beauty, Rapunzel, and Little Mermaid. 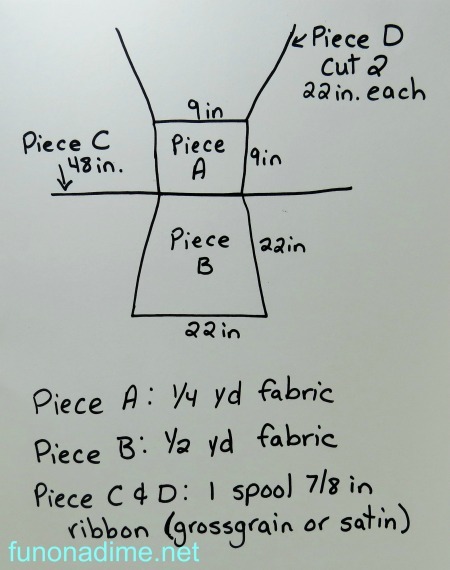 Here is the basic pattern for you to sew your very own. I am definitely not a professional sewer or pattern maker so bare with me. I made these for my 4 and 6 year old but my models were my 8 and 10 year old so as you can see they fit a variety of sizes! 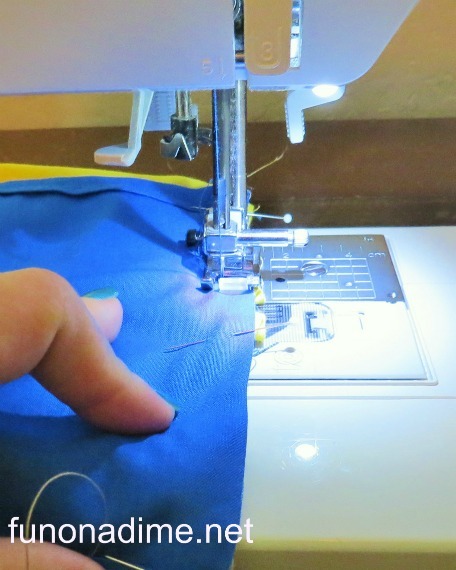 Step 3: Then sew each of the sides that are ironed with a 1/4 in seam allowance. Piece A ad B. 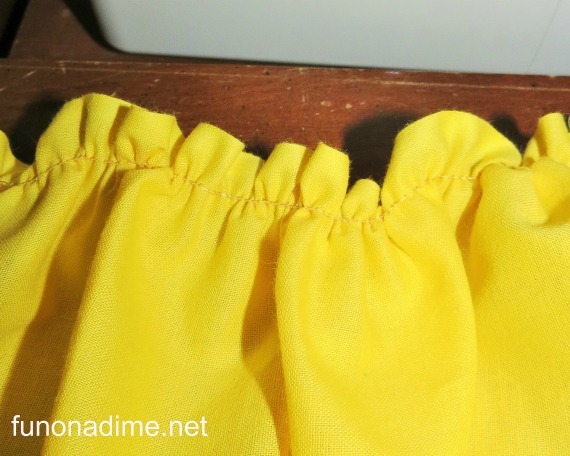 Step 4: Now you get to use my Fabulous Time Saving Ruffle Tutorial video to gather the top edge of the bottom of the skirt on Piece B. 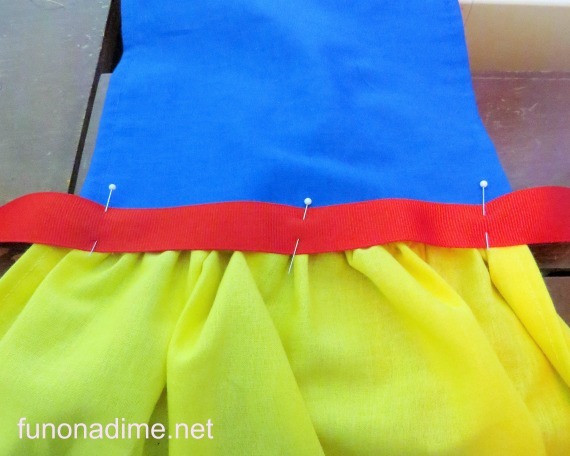 Step 5: Use pins and pin together the bottom of Piece A and the gathered top of B. I like to sew it twice to make it more sturdy. 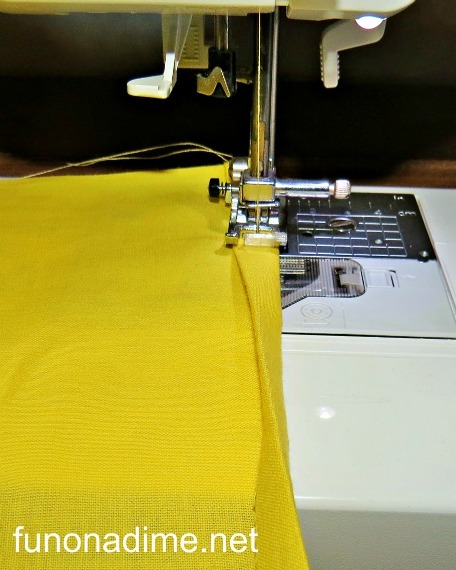 Step 6: Next cut your ribbon to make Piece C and D. The waist ribbon is 48 inches (Piece C) and the strap for the apron is 22 inches (Piece D – cut 2). Step 7: Pin Piece C across the middle where the two fabrics meet and sew along both edge. 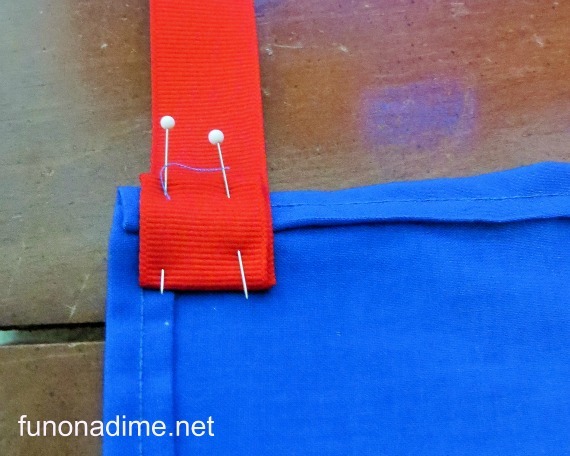 Step 8: To attach Piece D to the top, fold over the ribbon to help with fraying before sewing it and add a pin to each corner (see pic below). 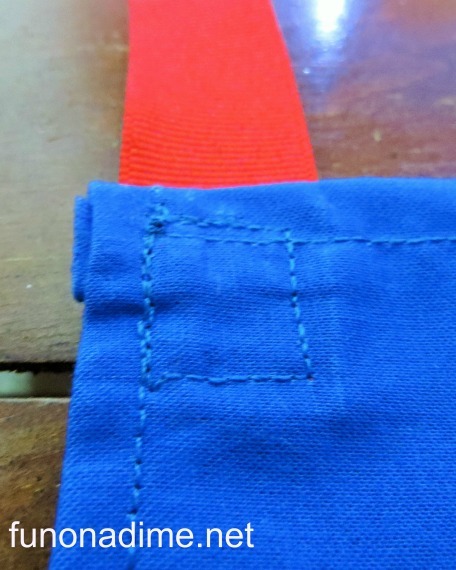 Step 9: Sew a square, to secure the folded ribbon (from Step 8), so that it is extra sturdy. 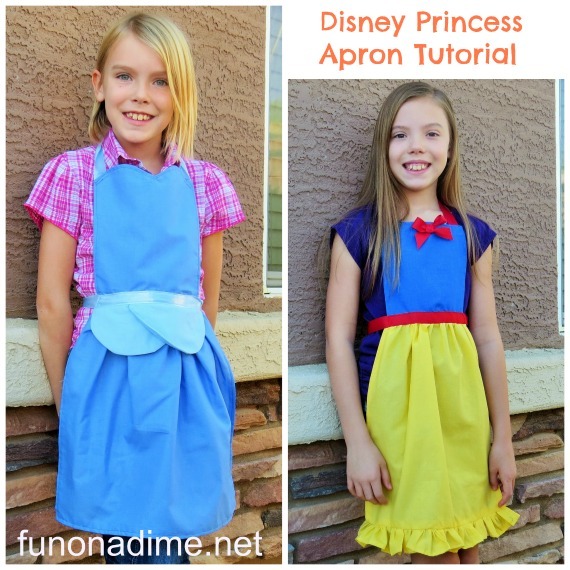 Step 10: That is just about it for a basic apron! I use this fabulous Fray Block (you can get it here) to keep my ribbon from fraying. You add it to any ribbon edge you have cut. I usually add this on at the very end, but you can do it any time. Any embellishments that you want to add can be added and they can be made out of any color. The possibilities are endless with these things. 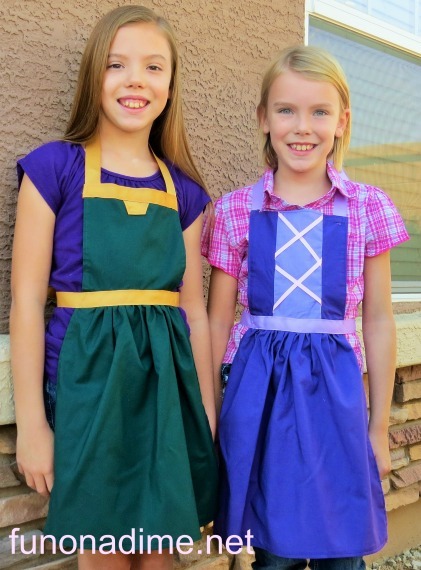 As you can see I made some with scalloped tops and added little aprons to others. I just traced a large can I had in my sewing room for these things, but the basic size for the fabric stays the same. I would love to see what you come up with. PLEASE SHARE!!! Filed Under: Birthdays/Celebrations, Blog, Christmas, Creative Gifts, Freebies, Halloween, Sewing Tagged With: Blog, Crafts, Fun, kids, Made By Me! You will totally have to send us a picture of them when they are done! So glad you liked them. Courtney is one talented lady!